Easy To Use Step By Step User Guide 5 Bottle Pro Paint Scratch Kit is for all years, makes & model vehicles is the latest and most efficient innovated car paint scratch kit on today’s markets that will work for you correctly removing all types of light scratches and camouflaging heavier scratches on metal. Predominantly this car scratch repair kit is recommended for use on car body panels and parts that are painted with a factory metallic paint finish where on impact all paint layers including primers have been completely removed and bare metal is visible. 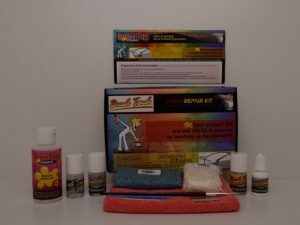 This paint scratch repair kit includes everything possibly needed including exactly matched actual factory color products that target small light paint scratches to heavy paint scratches on steel painted surfaces. The 5 Bottle Repair Kit is designed to give the end user the best possible results at the most economical price. This 5 Bottle Brush Touch Pro Kit is manufactured by qualified field paint & repair experts along with leading global vehicle manufactures factory original paint colors, certified materials, supplies and procedures. There are two ways only really to repair vehicles paint scratching. 1) poorly or 2) correctly. It is simple, car paints in particularly are made of many different types of paint layers and to get excellent or perfect paint damage repair results we recommend one should reapply the layers in the same manner as the factory when repairing scratching, scraping, stone chips and other types of paint damages. Repairers choosing to replicate a multi layered damaged paint using only a single paint repair product may dramatically increase the chance of the applied paint ending up looking totally worse than the original paint damage. 5 Bottle Brush Touch Pro Master Scratch Repair Kit collection when applied will leave your vehicle looking fabulous and increase the value of the vehicle while saving you money after applying renowned affirmed global procedures & products in just a few simple easy to use step by step guide. Removing unsightly car marks and paint scratches has never been so easy and efficient. The simplified repair guide included along with the video workshop manual online will help you achieve incredible results in a very short time. 1) Remove & clean impact residue paint transfer from painted surfaces. 2) Remove light Scratching & stubborn marks in the clear of metallic paint. 4) Restore color that has been removed using original factory O.E.M exact match paint. 5) Restore, shine & seal paint color using factory gloss clear to get long lasting permanent repairs. Disclaimer – The Comprehensive Brush Touch Pro Master video shown on this page is a touch up paint complete repair solution. This 5 Bottle Brush Touch Target kit repair steps are also shown in order in the video. The method here is also used in the Brush Pen, Pens & Kits.